Two Cheeky Frogs: The round up: St Patrick's day! Our weekend turned out to be crazy busy! We ended up not getting around to all of the crafts that we had planned. Kermit did not have school on Friday morning, so we quickly whipped up a batch of the Mint chocolate chip cookies. 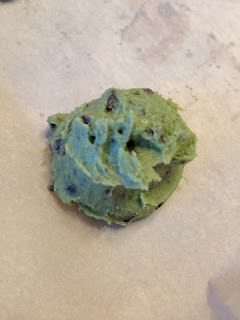 We used the cookie mix from Glutino, and I have to say, I was pleasantly surprised! Kermit was lucky enough to take one of the cookies to school, along with other green snacks! Tadpole kept asking if it was Ice-cream! 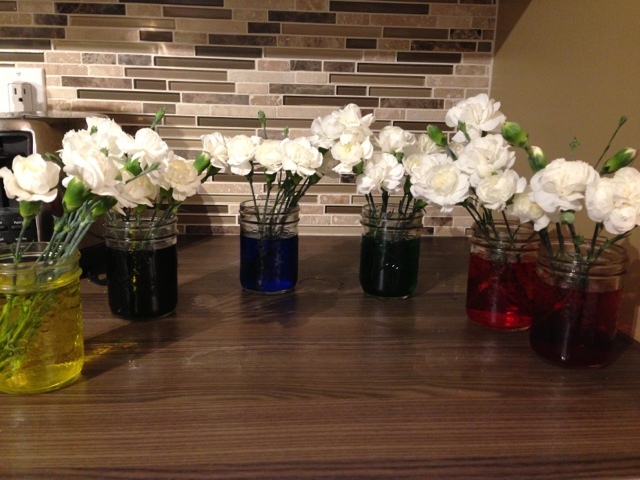 When Kermit came home from school, we did a little science, we divided the carnations between the mason jars, and added the food colouring. Kermit had a great time telling Tadpole which colours to mix! 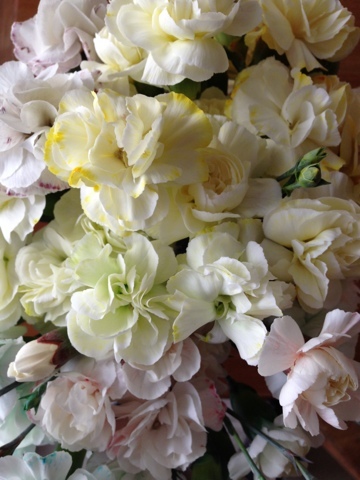 We kept an eye on the flowers all through the weekend, within a few hours we saw colour creeping into the petals, especially the green ones. The results were not as dramatic as we anticipated, but there was definitely a change. I surprised the boys with a Shamrock bath on Saturday morning. I added green food colouring to the water(Apparently it doesn't affect the colour of your tub or your children!) 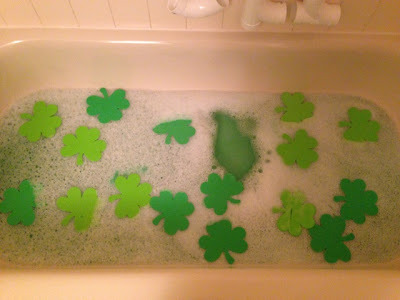 I found a big pack of the craft foam shamrocks on sale a few weeks ago. When they are wet, they stick to the side of the bath. The boys had a great time playing with those, it turned into a little math activity as they made patterns all around the sides of the bath. 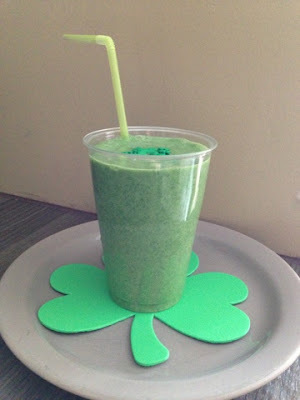 For snack we combined Bananas, frozen mango and Spinach, Vanilla drinking yoghurt and milk to make our Shamrock smoothies. Tadpole had it behind his ears and in his eyebrows. They loved it! 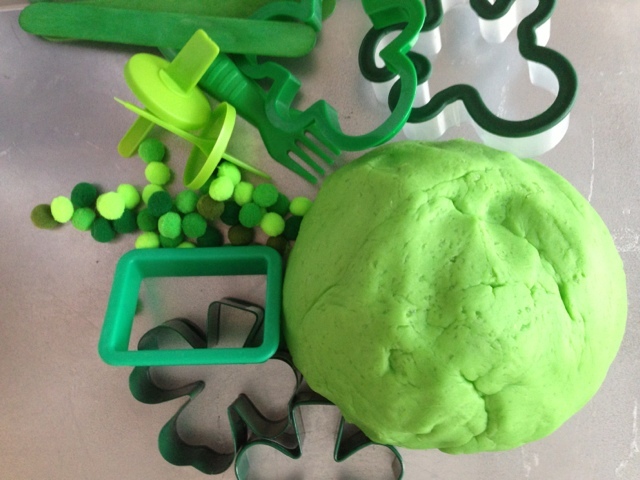 We made the play dough after snack time, Kermit really enjoyed reading the recipe and measuring the ingredients. They used the cookie cutters, pom poms and tools to make many wonderful creations! I loved the recipe too. It was quick and easy. I totally cheated and used my big mixer with the dough hook attachment to knead it. 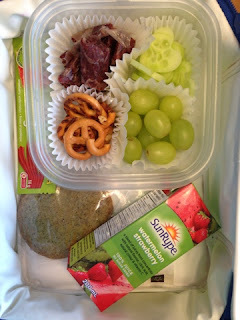 We enjoyed a Leprechaun's lunch. 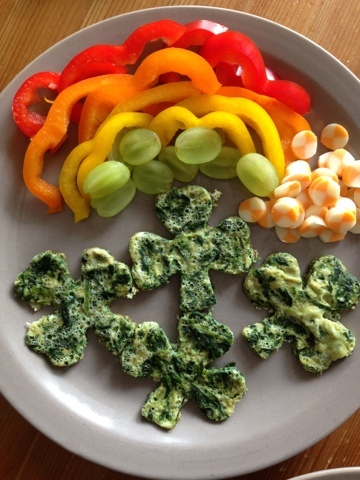 Shamrock omelettes with Spinach, rainbow peppers and "gold coins" at the end of the rainbow! I wish we had more time to get around to all the other fun we had planned! We'll try again next year! What did you get up to?